In the February 1992 Vanity Fair, Norman Mailer wrote that despite Oliver Stone’s clumsiness with facts, “The first thing to be said about JFK is that it is a great movie, and the next is that it is one of the worst great movies ever made.” Leave it to Mailer to have it both ways, but he’s doing nothing that Stone isn’t. It’s been years since I’ve seen a movie I consciously fought against seeing—but ended up enthralled by. Avoiding JFK had nothing to do with what Stone was doing with purported facts, the ever-expanding periphery of lies, concoctions, suppositions; he is, after all, the movie provocateur of our time and it’s his indisputable right to scorn whatever he wishes. I hesitated because who really wanted to see that g.d. Zapruder home movie blown up, or have to again hear claims the Warren Commission didn’t cover up what happened? (Edmund Berkeley’s prediction: LBJ, with help from Hoover, Dulles, perhaps Nixon, instigated a coup d’etat. To be fair, and backed by recently released audiotapes, LBJ, though he signed on to its report, never believed the commission’s conclusions. In Oswald's Tale: An American Mystery, Mailer himself concludes that he’s only about 75% sure that Oswald did it, maybe 60% sure that he did it alone.) The stuff of conspiracy, given lasting life because there isn’t any irrefutable evidence to support the “lone nut with a rifle” theory. Stone’s most unsettling contribution may be in casting doubt about Lee Harvey Oswald’s marksmanship: not only do Oswald’s own military records indicate he was a less-than-average shot, but Gerald Ford, the then-only living enthusiast of the WC, cheerfully embraced the psycho dramaturgy that Oswald was a “failure,” “sexually impotent” and victim of his wife’s berating, which, if right, suggests an instability that lessens his chances of being able to fire off, with trees obstructing his view, three rounds from a cheap 6.5 Italian Carbine in roughly six seconds. 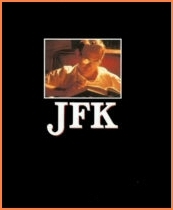 As entertainment, JFK is the American movie of its year. Making it inexplicably great is that many of us can’t figure out how Stone’s able to put the jangling disparity together in such an intensely consumable style. He’s holding us so rapt that we get carried along, feeling surges of excitement we haven’t felt from movie viewing in a long time. Submitting to Stone’s disputations is rather like reeling from a pent-up citizenry’s vindictive high: JFK is a composite of theories, not definitive but exploratory—a long spasm of conjecture to tantalize and stagger with possibilities and at the same time an admonishment for acquiescing to the volumes of lies. There’s something heroic in New Orleans district attorney Jim Garrison’s persistence in establishing doubt about the Warren Report; but there was only pity and ridicule left when in real life he was denied his chance to prove his case—because, in conspiratorial irony, all his central witnesses died before the trial. Stone sees Kevin Costner as a 90s Garrison-narrator in a smörgåsbord docudrama about alleged facts that have come to light long after Clay Shaw was acquitted of any links to Kennedy’s death. This the central reason why Costner’s summation runs on—Stone wants to get every conceivable denunciation on record. Costner’s vocal limitations are noticeable only in that he’s providing an accent as affectation that Garrison didn’t have or use. In bad clothes, pedestrian glasses, with touches of gray in his hair, he’s deglamourized; he’s so bland that while most everyone else around him leaps with paranoid energy, he gains our respect by his sheer ordinariness. In a speech before the National Press Club in Washington about the WC, Stone said, “Ladies and gentlemen, this is not history, this is myth. It is myth that a scant number of Americans have ever believed. It is a myth that has sustained a generation of journalists and historians who have refused to examine it, who have refused to question it, and, above all, who close ranks to criticize and vilify those who do.” A few days later, Andy Rooney, on “60 Minutes,” joked that Stone was our era’s Orson Welles looking for his Rosebud and unwittingly confirmed Stone’s legitimate deploring of our lazy press. What Stone has really made is his own and much more horrifying and brutal Manchurian Candidate, a polemic as counter-myth, a refutist’s grand mal as dazzling, work-me-over movie making in the most flagrant traditions of disreputable press muckraking; as you watch the movie unfold, and after it’s over, you have the grandest of mals thinking the worst possible thoughts about everybody. Text COPYRIGHT © 2003 RALPH BENNER All Rights Reserved.